A mild air mass is keeping temperatures warmer than average this weekend, peaking in the 40s across the area. This is only short lived, however, as a much more wintry pattern develops for the region starting next week, with much colder temperatures only reaching the 20s for highs and the 10s and single digits for lows. Along with the cold come two snow potentials; a minor event producing light snow on Monday night, and a potentially bigger storm on Friday and Saturday. Currently, an intensifying low pressure is located over the northern Great Lakes, which will continue to move northeast into southeastern Canada. This resulted in a SW flow today with much warmer temperatures, peaking in the low 50s for some. A cold front will move through on Sunday, with partly sunny skies and highs reaching the low to mid 40s across most of the area, with the coolest temperatures further west, and warmest temperatures further east in Long Island and Connecticut. Stronger WNW winds are expected as well, with gusts up to 30-40 mph. This cold front will end the mild pattern that persisted for most of the first 20 days of January, bringing in an actual wintry pattern into the region for the first time since early 2011. Since early 2011, the region has not been under a sustained wintry pattern; the 2011-2012 season barely featured any cold lasting for over a few days, and the majority of December and January so far have been much warmer than average. 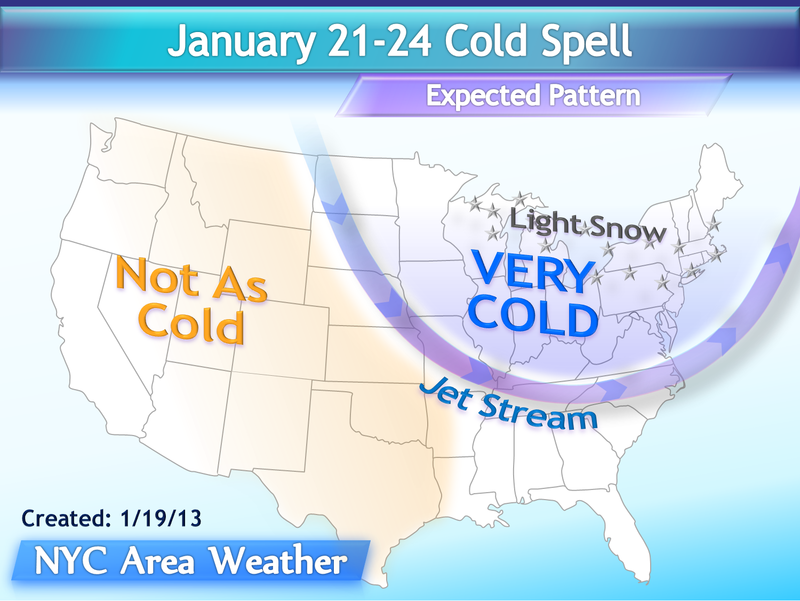 This will change next week, with a strong trough focused over the eastern US with much colder than average temperatures. The warmest day next week will be Monday, with highs in the upper 20s to low 30s across the area. A weak and moisture starved low pressure will move through the region with mostly cloudy skies and scattered snow showers, with a stronger low pressure developing offshore overnight into early Tuesday while moving east/ENE and offshore. Most of the precipitation from this will focus over southeastern New England, with light snow expected for the area with light accumulations possible, especially in Long Island and southern Connecticut. While this is expected to be a minor event at this time, the possibility is there that this ends up producing moderate snowfall accumulations over 3 inches in eastern parts of the area. More information will be posted on this with Sunday’s update. Temperatures on Tuesday will be much colder, only peaking in the low to mid 20s inland and mid to upper 20s for the rest of the area, which along with a breezy WNW wind will result in wind chills in the 10s for most and possibly single digits inland. Wednesday and Thursday will be the coldest days of this time period; partly to mostly cloudy skies are expected, with highs in the upper 10s to low 20s inland and the low to mid 20s for the rest of the area. The cloud cover will limit how cold overnight temperatures end up; there is still some uncertainty regarding this part of the outlook, and the forecast low temperatures are subject to some revisions, although at this time lows are mainly expected to be in the low to mid 10s for most of the area, with single digits inland. Wind chills in the single digits are likely for most of the area, possibly below zero degrees inland. With the strong trough lifting out of the region, the next storm is set to affect the region late next week into the early weekend. The setup for this time frame is the most favorable for a snowstorm it has been in a while, with ridging in the western US and a trough in the central-eastern US, a low near 50N/50W, and weak Greenland ridging. The models still do not have a solid handle on this event, ranging from the UKMET and CMC which keep most of the heavy snow limited to the interior Northeast region with snow to rain for the NYC area, to the GFS and ECM which keep the area with plain snow but with the heaviest snowfall south of the area. At this time, there is high probability of precipitation affecting the area during this time frame, and given the strong cold air mass initially in place, at least some snow is likely. It is still a bit too early to narrow down to a specific scenario for this storm given it is still 5-6 days out and the model guidance is not very consistent, although this storm is unlikely to track too far north to result in a mainly rain event for most of the region, and the potential exists for at least a moderate snowstorm to affect parts of the region, including the area. Stay tuned for more information on this storm over the next few days.